Edward (Ted) Charles Christmas was born in Lewisham in 1867. By 1871 his family was living above the stables of Prospect House, which is now 79 London Road (on the corner of Taymount Rise). Ted’s father was the gardener at Prospect House, and its garden extended from the rear of the house up Taymount Rise to St Paul’s Church. In his early years, Ted trained as a carpenter and then went on to install “sanitary plumbing”, electric bells, burglar and fire alarms, Lincrusta wallpaper and Roman mosaic tiles. However, his speciality was “artistic joinery” and there were, apparently, many fine shop fronts installed by him. Throughout Forest Hill, Ted Christmas and his construction company built a number of houses and converted other properties to flats. Many of these houses form the basis of the Forest Hill Conservation Area, which includes properties on Thorpewood Avenue, Round Hill and London Road. 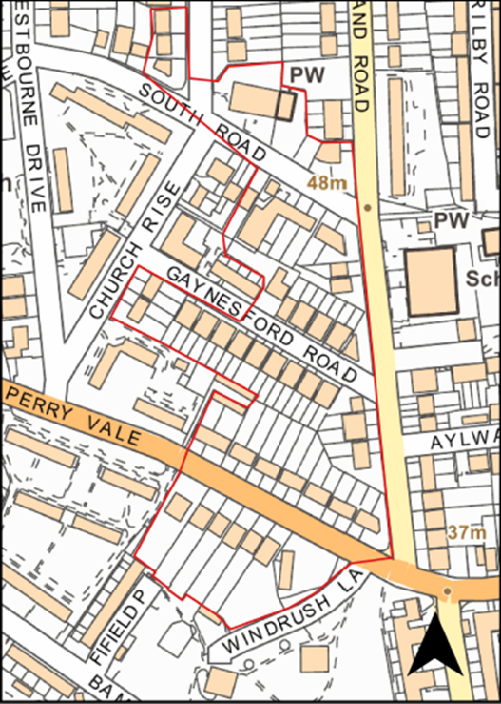 Unfortunately, there has not been any protection for the houses in the Perry Vale area that form a key group of Christmas houses. His best-known and one of the earliest developments is located between Perry Vale and South Road in Forest Hill. In 1901, he completed 108-116 Perry Vale: five substantial, detached houses called Linstead, Ashdale, Ulverston, Rosaville and Aberleigh in honour of his wife, Laura. A couple of years later, 131-153 Perry Vale were completed, their names spelling “Ted Christmas”. Round the corner, 72-64 Sunderland Road spell “Grace”, his daughter’s name. 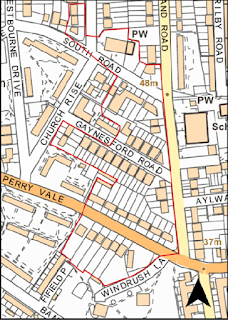 He also built houses in Gaynesford Road and several other groups of houses in this area. They are distinctive, and easily recognised. As a result of concerns by local residents, Lewisham Council are now consulting on creating a new conservation area to recognize and protect these houses alongside a number of other architecturally significant buildings in the area. The conservation area would stretch from Perry Vale to South Road and from Sunderland Road to Church Rise — a small area, but one which includes some lovely buildings. As well as protecting these Christmas houses, the conservation area makes note of some important memorials in the graveyard of Christ Church on South Road. 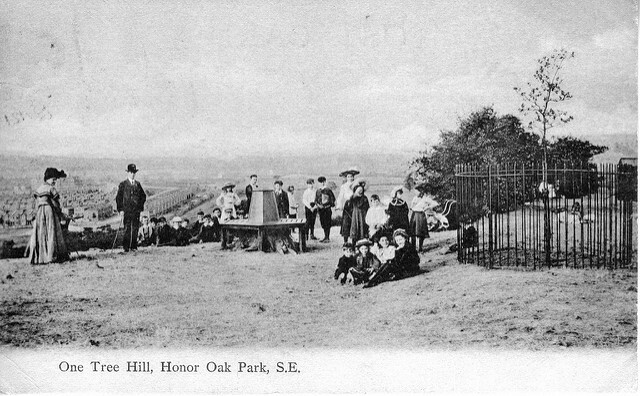 Of particular interest is the 15-foot obelisk memorial to George Baxter (1804-1867), the inventor of colour printing; and Joseph and Edward Tetley, the founders of Tetley Tea, which was just one of the tea brands owned by Forest Hill residents in Victorian times (another notable brand being Horniman Tea). Successive generations of families from Forest Hill and beyond have enjoyed the Horniman Museum’s collections and gardens. The museum has now brought together in its new World Gallery over 3,000 objects from around the world that explore the fundamental question of what it means to be human. The World Gallery continues Frederick Horniman’s ambition “to bring the world to Forest Hill”. At the entrance to the gallery is a series of audio-visual digital installations that show people from the Horniman’s community groups, volunteers, collectors and anthropologists talking about objects that have personal meaning to them. Next to the displays are objects selected for their emotional resonances — can you connect with them? Just imagine what it was like 2,000 years ago using the black obsidian mirror on show, and peering at your image in its dark depths. Next, you find yourself in the first of the five Encounters areas, each corresponding to a continent. Check out the head-hunter ornaments in the Asian area. Before the arrival of Christianity, hunting heads was essential if a man wanted to gain the respect of his community. Each would try to outdo the other in the extravagance of the ornaments they attached to their garments. Across the aisle in the African area are fascinating objects from across the continent. Check out the monkey crossbow belonging to the Mbendjele people or the life-size camel with its carefully crafted saddle — do you think it would have been comfortable to ride? Have a browse around the Nigerian market. In the Oceanian area, children will be fascinated by the projection of the ocean onto the floor showing fish swimming. Imagine travelling from island to Pacific island in the small canoe on show — it must have felt tiny to be in it at sea. The focus of the American area is on native Americans and people of the Arctic. Listen to stories and touch the material used to keep polar hunters warm while they stalked their prey. In the European area is to be found the Horniman’s own cloutie tree. In Britain in ancient times, scraps of fabric were tied to trees growing near sacred wells or springs as part of a healing ritual. You are invited to write down your wish and attach it to the tree — maybe it will come true! From Eastern Europe there are quirky Turon masks embodying the dark forces of nature — objects I associate with Africa rather than Europe. The gallery culminates with the Perspectives area, which presents objects in a variety of categories such as Textiles and Curiosities. It poses questions about how we classify the world around us, who decides what a thing is and whose knowledge is important. You are invited to add your perspective on what you have just seen. Flying above all these wonderful objects is a beautiful display of kites and banners hanging from the newly renovated ceiling vault. Collected and commissioned from Guatemala, China, London and beyond, these emblems signify our human instinct to come together in celebration, play or protest. If you haven’t already done so, take yourself and your family to the Horniman to see the new World Gallery. It’s well worth the experience! We are Helen and Maya, the founders of Featured in Fifteen. 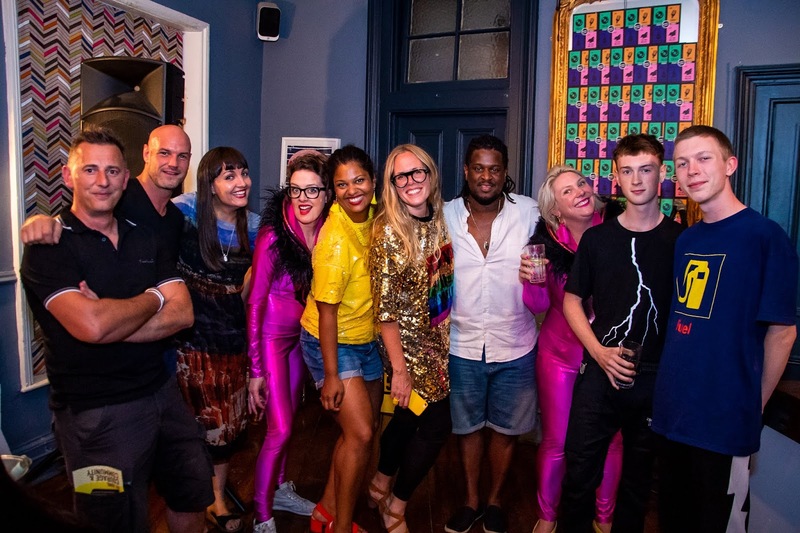 As we’re local Londoners, we wanted to create a community arts movement that celebrated the FFabulous rich mix of creative talent that we have in Forest Hill. The FF concept was born around a table (in late May 2017), just before school pick-up. We sat and thrashed out ideas around “What would be our perfect night out?” The answer was an evening of interesting talks by various local curators, a drink with friends and somewhere not too far from home. Since we both had a genuine respect for TED talks, the idea of providing an audience with more than one speaker (with a drink in hand) in a limited timeframe (15 minutes) felt like an interesting challenge for us — so that’s when Featured in Fifteen came to life. So how does FF Function? We spend a lot of our time hunting down amazing people — which isn’t easy because a lot of these incredible people are not always on social media. We read, we watch and we spend time in and around our area, listening and engaging and opening ourselves up to unexpected conversations, which lead to nice surprises. We work FFuriously hard to select FFive features for each event, all from different creative disciplines, as we feel this adds to the intrigue and interest of the night. We then create a theme that binds the evening together. And that’s the FF Formula! We make every event personal, with each of our themes coming from our own experiences and feelings, and this is what makes every FF evening unique. The people we’ve had the privilege to meet and to become connected to have enriched our lives and given us a new perspective on so many aspects of life and the wider world. Organising FF has been an incredible amount of FFun, laughter and FFriendship. Looking back over our first year, we had no idea FF would become what it is today — a calendar event that our community looks forward to. To date we have curated eight events and featured 35 FFantastic, inspirational local individuals, and we’ve created a wonderful network of creativity that everyone involved feels connected to through FF. If you haven’t been to a Featured night yet then please do make it to our next event on October 18th at The Signal pub in Forest Hill. Tickets are £10 and available via our website www.featured15.co.uk; please bring a FFriend and spread the word about our project whenever you can. Time flies but it’s been two years since our library was saved by a community consortium comprising V22 — the arts organisation based in next-door Louise House, the Forest Hill Trader’s Association, the Forest Hill Society and several local individuals concerned by plans to close the library. Since then, the library has flourished. At the end of 2017, the number of visits each month was 15 per cent greater than a year earlier and in 2018 consistently exceeds 11,000 every month. Book borrowing is also healthy, particularly by the under-11s. This is very evident in the Summer Reading Challenge, which aims to get kids using libraries and reading during the summer holidays. In 2017 Forest Hill had more children take on the challenge than any other library in Lewisham except the main central library itself, and we had more children complete the challenge than any other community library. More than 250 children gained a medal for reading six books. Over 430 children signed up to the challenge and we are well on the way to achieving the target set by Lewisham libraries. It’s great when children become library members for the first time in order to tackle the challenge. Forest Hill Library is open and staffed for longer than any other community library in the borough and, with the exception of Blackheath library, issues more books per square foot than any other library. It is an incredible success story on so many fronts. Securing the future of the library was a major motivator behind the community bid in 2016. But the library is far more than just a source of books. For many people it is vital as a means of engaging with the digital world and, regardless of the day of the week, the 17 computers in the library are busy. Activities for under-5s run every Tuesday morning and Thursday afternoon (never have I seen so many buggies in one place! ); Origami classes take place on Saturdays; a reading group meets once a month; and the library arranges speakers for the Lively Minds Group on the first Monday of each month. The library’s success owes a great deal to everyone who so generously supported the community bid, to the management team of Simon Higgs and Stephen Bruce and to all the volunteers who keep the library open 66.5 hours each week. Being a library volunteer is a rewarding experience. Seeing the joy on young faces when they tell you about the book they have just read for the summer challenge gives you a warm feeling. When you help the lady who had just lost her husband use a computer to deal with the things that he had always handled, you know you have made a positive difference in someone’s life. We pay the bills by renting rooms and hiring out the back room for meetings, and with support from Leaf and Groove in Dartmouth Road, which turns donations of books and vinyl records into cash for the library. If you would like to be involved as a volunteer, or support the library by donating to Leaf and Groove or becoming a “Friend” (£30 per annum) please contact Stephen Bruce at the library by emailing contact@FHLibrary.co.uk or calling 020 8244 0634. On the first Monday of every month, Forest Hill Library hosts Lively Minds discussions for the over-50s. This is a small group that features a variety of guest speakers talking about a wide variety of topics and encouraging discussion amongst the group. 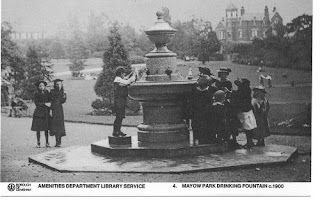 Since the library became a Community Library we have hosted a variety of discussions about such topics as local history, archaeology, Victorian sewage, improving local roads, philosophy, working for the intelligence services and lots more. Find out more about the next series of topics at the library. Tucked behind houses on Kilmorie Road is the Young Lewisham Project, which many people in this area may not even know exists! It’s a community project that supports young people in Lewisham to become responsible and valued citizens. Started as long ago as 1974, the project began when a group of local Lewisham residents were frustrated by the fact that some of the young people in their neighbourhood were getting into too much trouble, especially through stealing motorbikes. They knew it was largely because they were bored and had nothing to do, but just didn’t know how to tackle the problem. 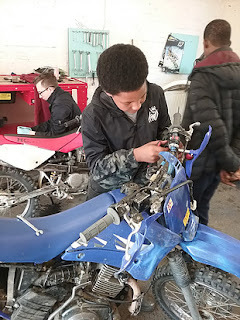 It was then that one of the residents came across a project in Birmingham that had set up a workshop for young people to fix motorbikes rather than steal them! Together, the local residents turned one of their garages into a small workshop and encouraged local youths to come along and learn the basics of motorbike mechanics; and the Young Lewisham Project was born. 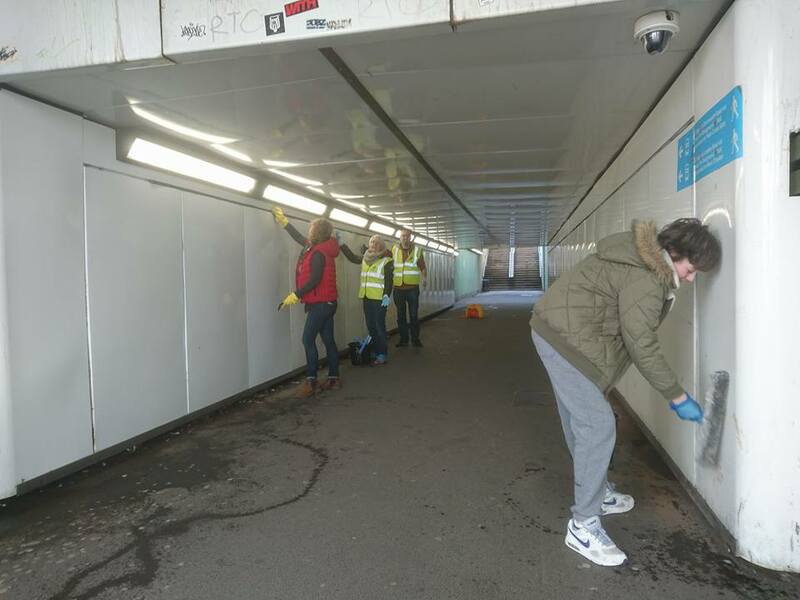 The aim of the project is to support young people to become active citizens, take responsibility, learn about the local community and understand how to improve their own surroundings; and to provide important links with other resources within the borough that support young people. Programmes that take place each week at the workshop site include motorcycle and bicycle maintenance, woodworking, furniture restoration, art, gardening and allotment work. Residential trips and off-site activities also take place throughout the year and the programme works with up to 150 young people each year who are referred by partner agencies. As with all charities in times of austerity, the Young Lewisham Project is always looking for volunteers to help maintain its success. Sometimes they need the help of volunteers in specific areas and are currently looking for someone who can commit for two or three days/afternoons a week to help with general administration —such as recording student information, collating information for funding reports and helping with general administrative tasks of the organisation. There are also plans to run some evening classes to utilise the workshop space and generate income. If you are interested in finding out more or getting involved, or are inspired by what goes on, please have a look at their website at https://www.younglewisham.org.uk. Thanks to the valiant efforts of a dedicated team of watering volunteers our plants in the town centre survived the heat wave, and the results of the RHS’s judgement will be known on September 20th, but autumn is fast upon us and so is the need to tidy-up and replant. Saturday 6th October is the date for your diary, meeting at 2:30pm at the front entrance to Forest Hill station. The summer plants will be edited and spruced up and hundreds of daffodil bulbs need to be planted to create a brilliant display for next Spring, when you will have the opportunity to admire the results of your individual handiwork. All are welcome, no experience is needed, but proximity to heavy traffic and parking cars means this event is not suitable for children. 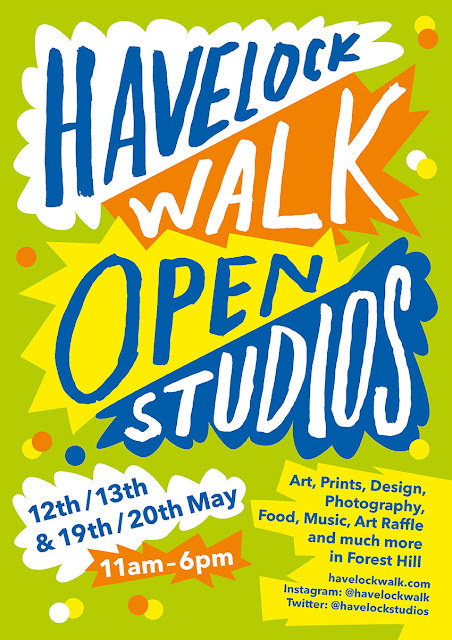 Please bring your own trowel/dibber and protective gloves, although we do have a few spares. Last autumn, the Forest Hill Society proposed a scheme to the Forest Hill Ward Assembly to provide a new path across the Horniman Triangle Park (across the South Circular from Horniman Gardens). 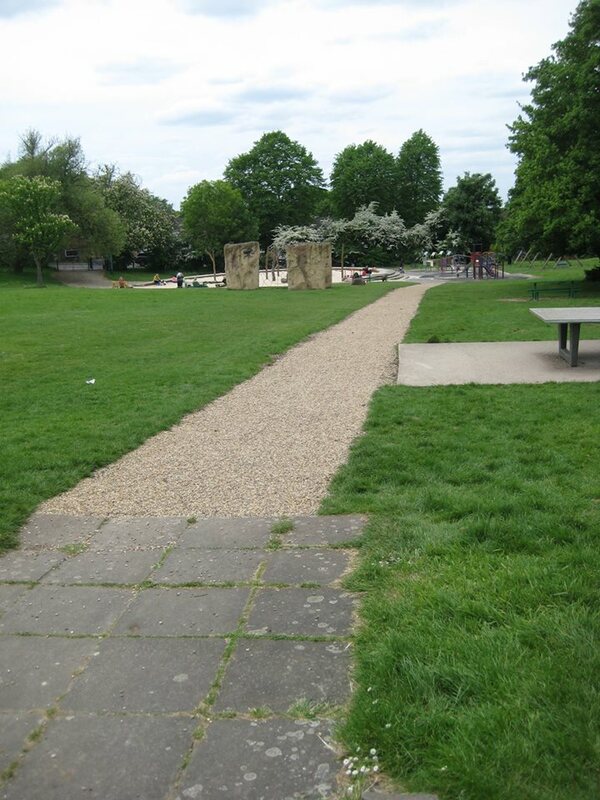 This path would link the Sydenham Rise entrance and café to the park’s play area. For many years the absence of a path has made the field difficult to cross, particularly with buggies. After severe rainfall the field would become very muddy and difficult to cross, but it was not always obvious until too late! With the support of the Forest Hill Ward Assembly, Lewisham Council and Glendale, a path has now been installed, making it easier to cross the field in all weathers. Suddenly, the park seems that little bit smaller (but in a good way) with the café and toilets much easier to access. Hopefully the path will endure the ravages of Forest Hill winters and provide easier access for many years to come. If you have other ideas about ways to improve Forest Hill please get in touch — we can work together to make them happen! You are warmly invited to join us at a Service of Commemoration to mark the re-installation of the First World War Memorial at 3 pm on Sunday 11th November 2018. 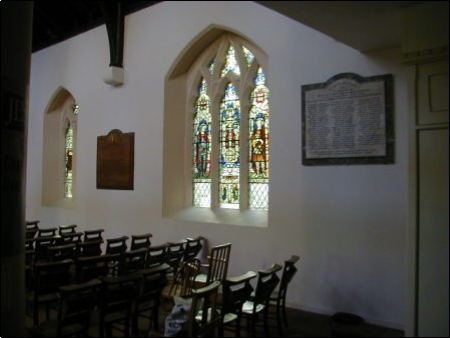 Many hundreds of local young men served in this most tragic and costly of wars and the War Memorial at Christ Church commemorates 68 of them from the Parish who lost their lives. There will be a booklet available which gives the details of all but one who have been traced: addresses, next of kin, ages, and date and place of death. Some names may be recognisable as grandfather or great uncle to those who still live in the area. The streets where they lived show that they and their bereaved families would have lived amongst us, as our neighbours. This summer, owners Julia and Richard announced that they would be selling the All Inn One on Perry Vale. All regulars to the pub will be sad to see them leave in April 2019 and will be concerned about the future of the pub once they leave. The new owner is considering the best use for the site, but has told the Forest Hill Society that a pub will remain on the ground floor and return to the old name of The Forresters. Since pubs are now protected by law, any demolition proposal would require full planning permission from Lewisham Council — we will be watching this closely, and working with the developer to ensure continued community use of this site. Artist’s impression of one possible rebuild of the All Inn One pub with residential units or a hotel above. Not far from the All Inn One, at the junction of Waldram Park Road (South Circular) and Stanstead Road, is the Co-op grocery store with a large forecourt which used to be a petrol station. A planning application was submitted earlier this year to convert this site to a 5-storey, 90-room hotel. On the ground floor would be a convenience store, roughly the same size as the Co-op; however, without any car parking, the Co-op is apparently not interested in continuing to operate on the site. The Forest Hill Society is supportive of this application in principle, but does have some concerns about service access for the hotel and store, and the on- and off-site parking ramifications for hotel guests, shoppers and neighbouring residents. However, a large hotel in Forest Hill could be of benefit to the community — by bringing more people to the area who would use local restaurants and shops. Between the Co-op site and the railway bridge to the west, on Waldram Crescent (South Circular), lies the Portakabin site. Proposals for its redevelopment currently feature around 21 flats with some form of commercial activity at ground floor level. 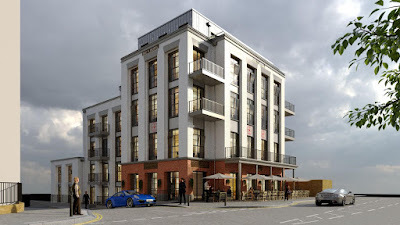 The development would rise from 3 storeys close to existing buildings on the eastern edge, to 6 storeys overlooking the railway line. Since this site has been under-utilised for too long, it is good to see this site, close to the town centre, being considered for redevelopment. The Forest Hill Society has spoken to the developers to encourage them to think creatively about the use of the ground floor space, as its location on the South Circular is not a good spot for pedestrian access. Given the site's proximity to the railway line and the South Circular, we have also asked them to consider every possible noise mitigation solution for the benefit of the flats' future residents. 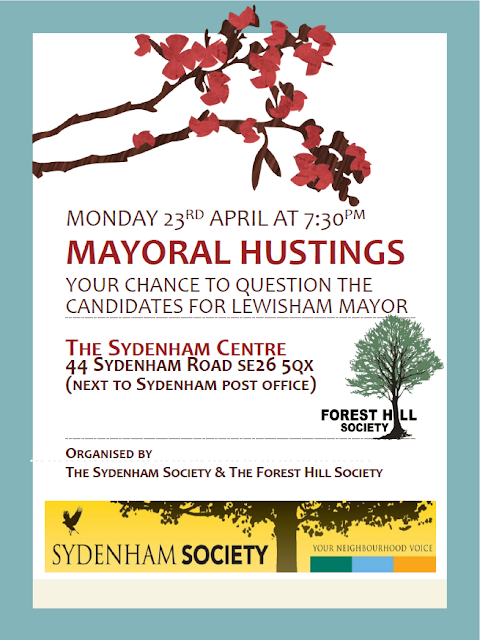 Your chance to shape the year ahead for the Forest Hill Society. Tell us what you think is important for us to do in 2019. There will be elections for the new executive committee. We are always looking for new people to join the executive committee or our teams working on Transport, Planning & Development, Environment, and Communications. We are also please to welcome a guest speaker; Daniel Raven-Ellison from London National Park City, who will be talking to us about the campaign to recognise the value of green space in London. A brand new Woodcraft Folk Group is starting in Forest Hill this September, 2018. The Woodcraft Folk; an educational youth movement, was founded almost 100 years ago in Forest Hill by Leslie Paul. A plaque is hung outside his former home on Bovill Road, SE23, so it is fitting and exciting that a group is established where its original roots lie. The Forest Hill group will meet on alternate Saturdays at the beautiful Dacres Wood Nature Reserve. The group is aimed at families with children, boys and girls, ages 3-5 (older and younger siblings welcome) to learn about big ideas through fun activities like singing, camping, arts and crafts, music, nature play and games. Subjects covered include caring for the environment, sharing, cooperation, nature conservation and much more. Our aim is to have great fun, but also to try to develop children’s self-confidence and build their awareness of society around them. Forest Hill Woodcraft Folk Taster Session (free). Ages 3-5. Andrew Orford and Alona Sheridan will lead us on a history walk through One Tree Hill on Sunday 23rd September, 2:30pm. Meet at Honor Oak Park station. Saturday 15th September 2018, 10:30am. 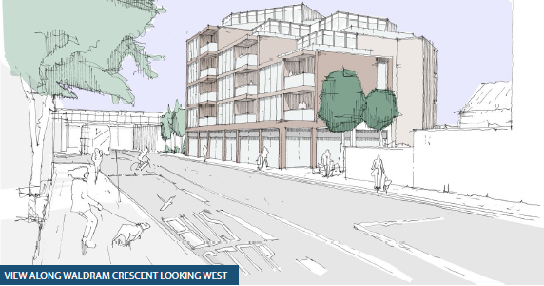 A planning application has been submitted to build a Holiday Inn in Forest Hill on the site of the Coop shop at 1 Waldram Park Road. 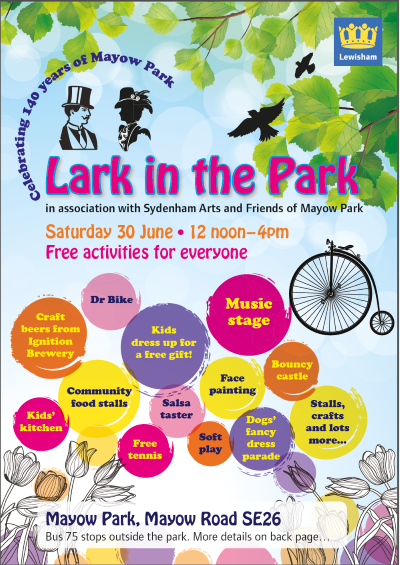 Details of the application can be viewed on the Lewisham Council website. The Forest Hill Society has written in SUPPORT of this application but with a request to consider certain aspects of parking, servicing, and high-quality design for the development, if it is approved. Full details of the Forest Hill Society submission can be read here. 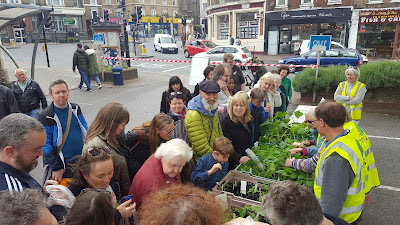 Come to Forest Hill station’s forecourt at 2pm on Saturday, 12th May, to collect your FREE edible plant. Working with the Horniman Gardens we distribute edible starter plants and herbs to encourage people to grow their own and think green. You don’t even need a garden! Any container on a window ledge will be fine so long as you remember to water the plant regularly. 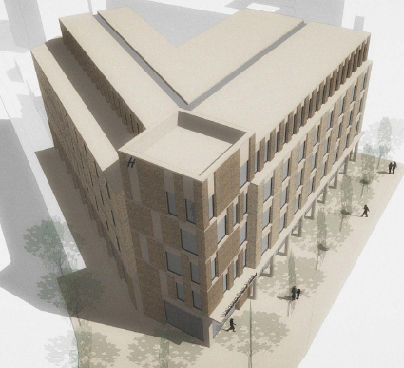 Lewisham Homes have submitted a planning application for the construction of one part four/part five storey building to provide fifty over 60s dwelling units. Details of the application can be viewed here. 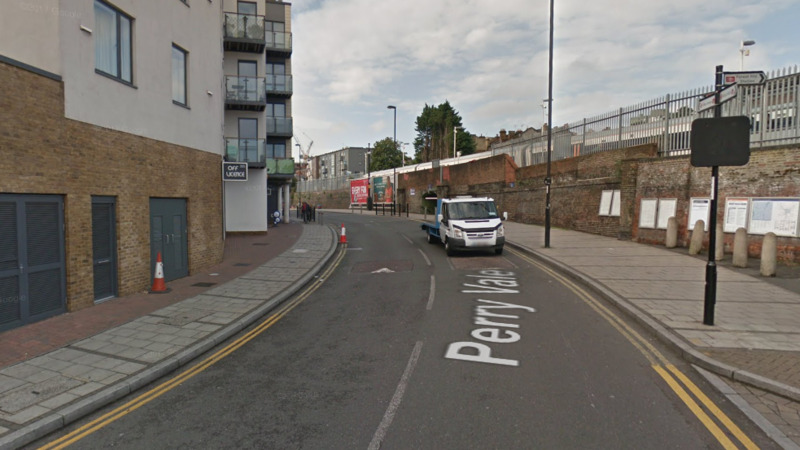 The Forest Hill Society have started a petition for a new crossing on Perry Vale. Many passengers exiting Forest Hill station wish to cross Perry Vale to go home and to visit local shops. Site lines are poor for pedestrians close to the station and shops, and the nearest safe crossing point is beyond all the shops (beside Perry Vale car park). This is not appropriate for a busy crossing point used by all sections of the community, including children and elderly people. A light-controlled pedestrian crossing (pelican or puffin crossing) would provide a safer crossing point for pedestrians and better manage traffic on the junction with Waldram Place. With the 20mph speed limit on this road, we believe that a light-control crossing at this location would provide greater safety for all road users. We ask that Lewisham prioritise the installation of a formal crossing at this location. If you agree, please add your name to this petition. The winter seems to have been a long one, but the Forest Hill Society’s Environment committee has been active, working with Energy Gardens in the area behind the bike stand on Forest Hill station’s Platform 1, with the installation of a ‘bug hotel’ and two new compost bins so that we can create our own compost. A new container of bamboo on Platform 2 helps to screen the metal railings as well as absorbing pollutants. We suggested to Lewisham Council the need for a footpath across the Horniman Triangle park, from the café to the play equipment area. Our idea was agreed by the Forest Hill Ward Assembly and work is now in the planning stage. Broken play equipment has also been mended and repainted. Concerned residents raised the problem of trying to use the path at the bottom of Horniman Gardens alongside the nature trail, which is almost impassable after heavy rain. Lewisham’s Highways Department has agreed to look into this and bring it up to standard. We have been in contact with our new MP, Ellie Reeves, who has forwarded our photographs (see inset) of the area beside the underpass, which gives access to the railway path to Network Rail, in the hope that this town centre eyesore can, at last, be dealt with. Fingers crossed that something can be done, sometime soon. Saturday 28th April, 2.00pm: Call for gardeners, young and old(er), to help create exciting new planters for Perry Vale. We will also have a general post-winter planting spruce-up session to ready this year’s entry to the RHS’s “It’s your Neighbourhood” contest. Meet in Forest Hill station forecourt and bring gloves, a trowel and secateurs, if you have them — if not, we have a few spares. Saturday 12th May, 2.00pm: Our popular Edible Plant Give-away. Once again the Forest Hill Society will be giving away starter food plants donated by Horniman Gardens to encourage growing your own, saving money and thinking green. Venue to be announced, but will probably be the station forecourt. 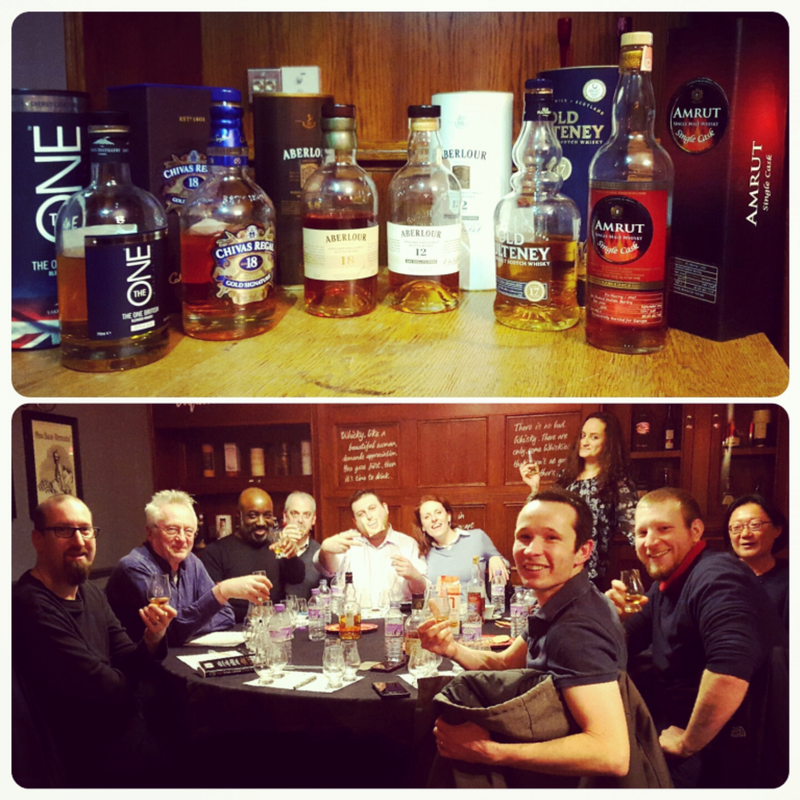 The SE23 Whisky club has been going for over three years. We meet every two weeks on Tuesdays at 8pm, in a pub in Forest Hill. Between 10 and 15 people usually attend each meeting to learn about whisky, understand more about how it is made, and which flavours we most enjoy. At most meetings we sample six small whiskies with a particular theme, and in doing so we learn more about the process of making whisky — including the water, the barrels and the shape of the stills. Many of the meetings are hosted by brand ambassadors, and we have had visits from ambassadors from Macallan, Suntory, Benriach/Glendronach, Chivas/Glenlivet, Whisky Exchange, Maverick Drinks, Paul John and Port Askaig. We look forward to welcoming Phil Huckle on the 3rd April for a Longmorn tasting. Within the club are a few very knowledgeable individuals (with rather impressive personal whisky collections), but most are novices who just want to know more about whisky and explore the vast range of whiskies available. The club is open to anybody: You just need to join the group at www.facebook.com/groups/se23whiskyclub/ for updates about forthcoming events. Some events are free, and some have a charge of £10 to cover the cost of the whisky for the evening. For further information, visit the Facebook page or Twitter @se23whiskyclub. Forest Hill, Perry Vale and Crofton Park Safer Neighbourhoods Teams are our local police teams, reporting to Sergeant John Biddle. 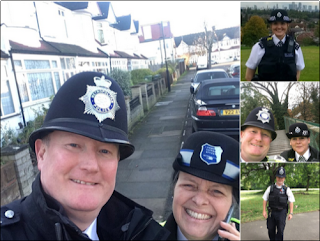 As well as working hard to keep our streets safe, they provide regular updates on Twitter (@MPSPerryVale, @MPSForestHill, and @MPSCroftonPark) and on the local forum — SE23.life. Regrettably, the police have recently reported a rise in house burglaries, thefts of mopeds and thefts of items from vehicles in the SE23 area. Nevertheless, some successes have been achieved in arresting suspected burglars in the local area, as well as dealing with drugs offenses and anti-social behaviour, and working with residents on crime prevention. At present all three teams are based at Catford Hill police station, but the Metropolitan Police have plans to close this station (as well as the main Catford police station) and deploy officers elsewhere. 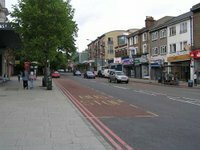 The current thinking is that the Perry Vale, Forest Hill and Sydenham teams will be relocated to Newlands Park, just inside Bromley Borough, with the Crofton Park team either joining them or being relocated to Lewisham or elsewhere in the borough. Each ward has a Safer Neighbourhoods Panel that includes representatives from local neighbourhood watch groups, residents’ associations, civic societies, councillors and traders. These panels help set the priorities for the police in their local areas, so that the concerns of residents can be dealt with. Alistair Dey looks at The Capitol pub and Forest Hill’s other former cinemas. In May 2016, JD Wetherspoon announced that they were going to sell off The Capitol pub on London Road in Forest Hill. Indeed, two years earlier there had been rumours that the pub was closing or being sold off or being converted back into a cinema. For a large, seemingly successful pub which packs in the drinkers and eaters, I found this to be a slightly strange decision. Over a year on, Wetherspoon’s pub is still there, possibly because they have not yet found anyone to take over the lease or because the building is a Grade II listed building. Whatever the reason, I hope the pub continues and, if sold, the building does not lie empty again as it had previously done in the mid-1970s and late-1990s. The Capitol is the jewel in the crown of Forest Hill’s cinematic heritage. It is believed that Lewisham borough once had more than 30 cinemas though not all in existence at the same time; Forest Hill had three of these cinemas. The Capitol had class: It had a Compton theatre organ which was in use, as required, until it was removed in the late-1950s, a café for the convenience of patrons and an impressive initial seating capacity of 1,691 in the stalls and circle. The stage was deep and wide and, along with three dressing rooms, it allowed for music and variety shows to be staged — music hall type shows into the 1950s and pop concerts in the 1960s. Since the cinema was designed and built just at the end of the Silent era of movies, sound equipment had to be installed very soon after it opened for the “Talkies”. The first sound film was The Singing Fool starring Al Jolson on 15 April 1929. This was the follow-up film to Jolson’s Jazz Singer, the first commercial Talkie. Some silent films continued to be shown at The Capitol for another year or so until the sound era took over completely. The cinema was taken over by Associated British Cinemas (ABC) in July 1933 and they operated it for the remainder of its cinematic life. The cinema was re-named ABC in December 1968 and closed on 13th October 1973 with its last two films being the road movie Scarecrow starring Gene Hackman and Al Pacino and Class of ’44 starring Gary Grimes. The building stood empty for several years until it was leased to Mecca Ltd and opened as a Mecca Bingo Club on 23rd February 1978. It was later leased to the Jasmine group and was known as the Jasmine Social Club. Bingo ceased in early December 1996 and the building again stood empty and unused. In September 1993, while still a bingo hall, the building was designated as a Grade II listed building. This means it is of special architectural or historic interest; considered to be of national importance, and therefore worth protecting; and warranting every effort to preserve it. The then Department of National Heritage described the building as “a rare survival of a complete 1920s cinema and the earliest complete cinema by J Stanley Beard now surviving.” This protection partly explains why The Capitol is the only former cinema in the area still recognisable as a cinema. The building re-opened on 9th May 2001 as part of the Wetherspoon chain of pubs, which brings us, 16 years later, to the pub’s uncertain future. The Capitol was undoubtedly one of the foremost cinemas in south-east London. There were, at different times, two other cinemas in Forest Hill. The first cinema, The Picture Playhouse, opened in September 1910 but was short-lived. This relatively small 400 seater cinema was created out of existing shop premises, with its auditorium at the rear, where the China House restaurant now stands at 18 Dartmouth Road. By November that year, a tea lounge had been added to the building. The cinema was then refurbished in 1912 and re-named the Empire Picture Theatre. It ultimately closed in February 1914 and the premises then reverted to retail use. In recent times it has been a second-hand furniture shop, Wok Express and now the China House restaurant. Forest Hill’s other cinema lasted longer before, presumably, succumbing to the embryonic TV age. The Stanstead Picture Palace opened in January 1913 at 12-14 Wastdale Road, just off Stanstead Road. Like The Picture Playhouse in Dartmouth Road, its entrance was created out of shop premises, with its 834-seat auditorium built at the rear. By 1927 it had been renamed the Stanstead Cinema and, in that year, it had a canopy installed over its entrance. Western Electric Sound was installed in 1931 to bring the cinema into the Talkies era. The cinema had a brief closure while this work was carried out, and re-opened on 26th December 1931 as the Astoria Cinema, with Marion Davies in It’s a Wise Child. Incidentally, this film was a Hollywood “Pre-Code” comedy. “Pre-Code Hollywood” refers to the brief era in the American film industry between the introduction of sound pictures in 1929 and the enforcement of the Motion Picture Production Code censorship guidelines in mid-1934. As a result, films in the late 1920s and early 1930s were often much less sanitised than later films and often featured some strong female characters. The cinema was renamed the Balmoral Cinema on 11th April 1954, but soon closed on 29th May 1954. It was re-opened as the New Astoria Cinema on 14th November 1954, but only lasted a few more months before finally closing on 26th February 1955. In August 1968, the building was converted into an independent bingo club. It later became derelict and was ultimately demolished in 1975 — as was much of the surrounding neighbourhood during that “wrecking-ball” decade. The site was later redeveloped and housing was built. The cinema, when it existed, was a few yards away from the old Swiss Cottage pub on Stanstead Road, which was demolished in 1990. 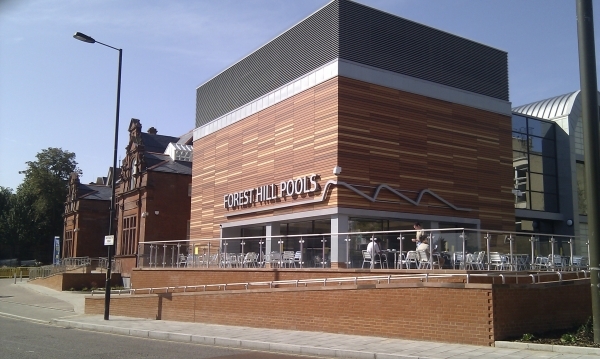 Although Forest Hill had three former cinemas, this is outmatched by Sydenham, which can claim five former cinemas at one time or another: two on Sydenham Road (where The Sydenham Centre and the empty Budgens supermarket now stand), one in Kirkdale, one in Silverdale and one at the Bell Green end of Perry Hill. Thanks to the book “The Big 5: Lewisham Super Cinemas” by Ken George and the websites “Cinema Treasures” and “Lewisham’s Lost Cinemas” for much of the information in this article. In a little-visited corner of town but close to Forest Hill Library, a magnificent church spire surprisingly emerges as if springing from the ground below, encircled by a cul-de sac of modest modern town houses just off Round Hill. My children, when they were young, were convinced it remained the only visible part of a large church buried below by a catastrophic mudslide, due to the deforestation of the top of Forest Hill. (I confess they may at least have not been discouraged from reaching this conclusion in order to foster respect for trees.) The truth is barely less astonishing: It is in fact the 330-year-old spire of a City church built by Sir Christopher Wren after the Great Fire of London in 1666! In the early 1800s, George Godwin stated, of the tower and spire, that "although they might not be termed beautiful or pure, display great powers of invention, and are of pleasing proportions" noting its clever octagonal and ribbed design with round shell openings at the base. He was less impressed by the composite Italian capital topping which he felt was too formal for such an ingenious design. Reputedly, in 1829 the spire was damaged by lightning and had to be replaced, although there is some contention that the stone was too heavy for the tower and was likely to have been of more traditional construction and had become unstable. One of the church wardens, Robert Harrild, purchased the upper section of the spire for £5 to save it from destruction. Harrild had business premises nearby and presumably developed a great affection for the building. He was the owner of a printing works and became a pioneer in the manufacture and sale of printing machinery, developing the use of composite rollers instead of hand-held balls to apply the ink. He became very wealthy and purchased Round Hill House, a grand manor house in Sydenham, to which he had the spire transported and re-erected in his gardens. The date is the subject of speculation, but it was known to have made its way to and been erected at Round Hill by 1850, where it stands to this day. Harrild’s daughter Mary married another famous local resident, George Baxter the engraver and printmaker, who lived at The Retreat in Peak Hill and after whom Baxter Field is named. The families were very close and Baxter’s sister married Harrild’s eldest son and heir. Harrild died in 1853, but the business continued under his sons until 1949. St Antholin’s Church was demolished in 1875 to make way for the construction of Queen Victoria Street, but a memorial stone tablet depicting the famous spire still exists nearby at St Mary Aldermary, Watling Street, having been re-sited from Budge Row, which also no longer exists. Round Hill House became The Sydenham and Forest Hill Social Club in the 1930s and was subsequently demolished in the ’60s, making way for the town houses we see today; but the spire survived, perched loftily on a brick plinth and complete with a ball and wolf’s head weathervane, along with a stately old Cedar of Lebanon tree from the original garden, both standing incongruously in the middle of the close. Sadly, there is currently justified concern for the future of the spire which on my recent visit now looks in a very sorry state — surrounded by plastic orange barriers, boundary walls and railings that are crumbling away, sprouting weeds and the absence of a plaque or inscription denoting its significance. 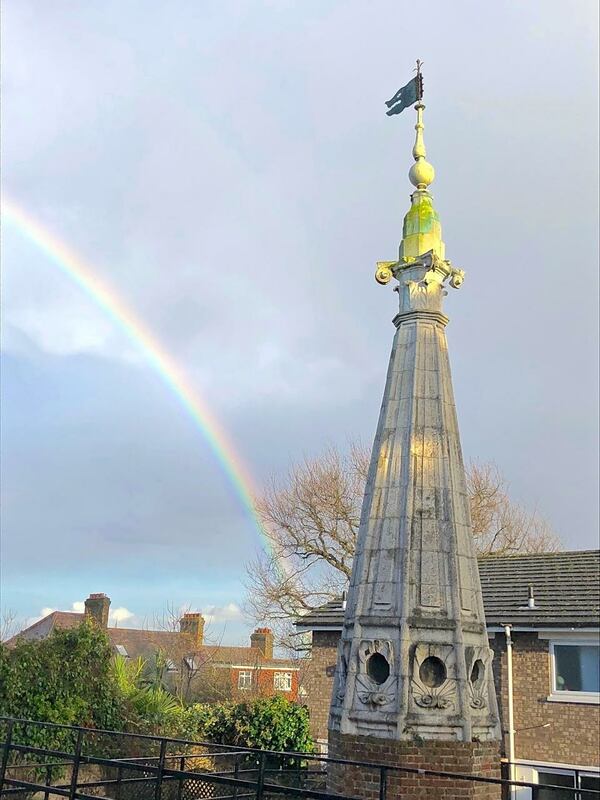 The spire is Grade ll listed by Historic England and we are expecting them to make a survey visit soon to report on its condition, hopefully as a first step towards its restoration. With funds for public works of any kind in short supply, how nice and appropriate it would be if a wealthy local business owner — a Robert Harrild of today — stepped forward to earn our respect and help provide the ‘TLC’ that this unusual local heritage asset needs? Local resident Margot Wilson told us about a very useful App. If you have a smart phone you can easily report problems in your street to the local council by using the FixMyStreet app. It’s easy to use for reporting problems such as fly-tipping, overflowing rubbish bins, faulty street lights, graffiti and potholes. Just take a photo, report where it is and the local council gets notified. 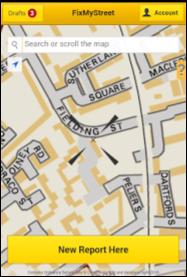 Alternatively, reports can be submitted online at fixmystreet.com. We’ve tried it and have gotten a few issues fixed by Lewisham Council. So if you see a problem, please report it. After the recent building works and refurbishment of Christchurch Chapel at St. George’s Church on Church Rise/South Road, its marble War Memorial was sadly not re-installed. The church aims to re-install the memorial, with a Service of Remembrance in November 2018. This would be an ideal time to bring it back into prominence as a significant memorial to the sixty-eight names it records. Among the names listed are poignant reminders of the loss of life: twin brothers; near neighbours; brothers; only sons. Some names can be traced and their addresses known, but others are a mystery. Perhaps a married sister wanted to commemorate a brother. Perhaps a fiancée, whose lover never returned to marry her. One young man was awarded both the DCM and the VC; another, who had emigrated to Canada from Forest Hill, the DCM. Do you know of any family members who were commemorated on this memorial and can you trace their stories? Please contact Janet Killeen via parish.office [at] stgeorgeandstmichael.org.uk. Horniman Museum — One of the Coolest Museums in the World! We always suspected as much, but this year the New York Times has named the Horniman Museum and Gardens as one of the ten coolest museums in the world. Out of the top ten, the Horniman is the only museum from the UK and one of only three from Europe — the others are in Germany and Denmark. We are very lucky in Forest Hill to have the Horniman on our doorstep, and the New York Times article is likely to entice more people to discover the wonders of the Horniman and hopefully venture further into Forest Hill. The Forest Hill Society are working with the Horniman to look at ways to link the Horniman into the town centre — to encourage people in Forest Hill to visit the Horniman, and for visitors to the Horniman to explore our delightful local shops. Later this year the Centenary Gallery will be re-opened after a major make-over and this will help keep Horniman’s place as one of the best museums in the world. The closure of Dartmouth Road has been an inconvenience for many residents and especially for shops, but the road will reopen on 11th March with all of its new surfacing and layout completed. 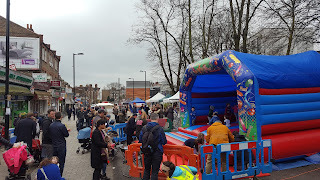 Before that, on Saturday 10th March, there will be a street party on Dartmouth Road, to enjoy the new road and pavements before it is reopened to traffic. Horniman Museum are relocating their weekly farmers’ market to Dartmouth Road for the day and there will be a variety of activities for children and adults, including music, dancing and bouncing! This will be a fun day to celebrate the new road, as well as the businesses and community that make Forest Hill so nice. Join us between 10am and 5pm. 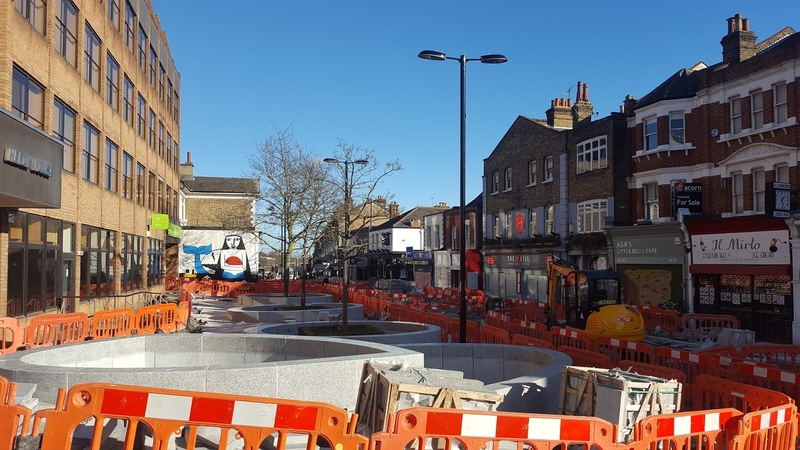 Once Dartmouth Road is reopened, there will be double yellow lines along more of the road to help keep traffic moving, and there will be a few additional parking and loading bays close to the shops. We have been promised enforcement of the parking so that we do not get a repetition of the parking on pavements that we saw when the road was undergoing changes. If you are willing to help set up and steward the street party, please email chair@fhsoc.com. It is almost time for our annual Forest Hill Society - Robert Burns Night Supper where we combine Scottish food, Scottish poetry, and a wee dram of Scottish whisky in a great evening. Once again, the Forest Hill Society in conjunction with All Inn One, on Perry Vale, will be hosting a Burns Supper on Saturday 27th January. There will be the traditional Address to the Haggis and the opportunity to listen to or to read from the works of Robert Burns. We will also have some local musicians to round off the evening. The meal is from 7.30pm, and if you'd like to join us you must book in advance, please call the pub on 020 8699 3311 or email info@allinnone.org.uk to book. The cost is £21.95 per person for 3 courses and a very enjoyable evening. (Please let them know if you would prefer the vegetarian haggis to the meaty version). Everybody is welcome; members, non-members, Scots, Sassenachs, and all friends of Scotland. Early booking is recommended as places are limited. Last year not everybody who left it until the last minute was able to get a seat.